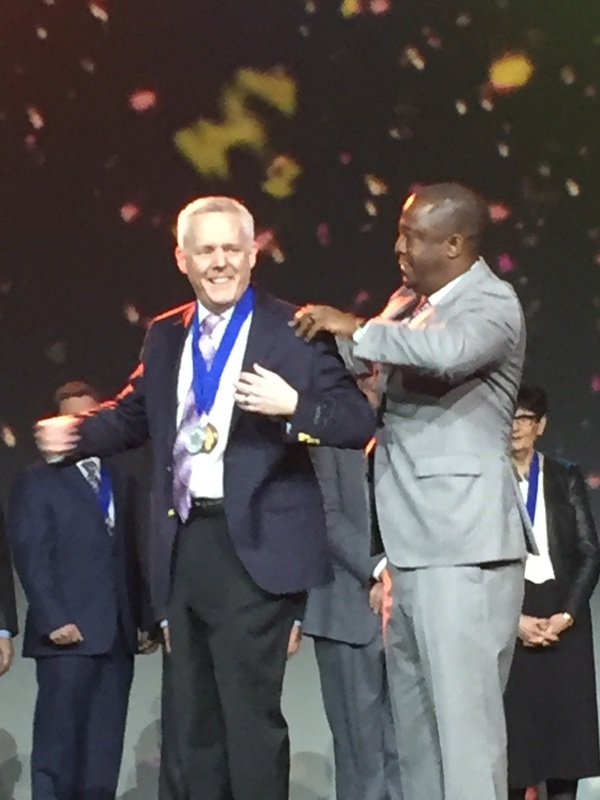 Matthew R. Utterback, North Clackamas School District Superintendent since 2012, has been selected by AASA as the 2017 National Superintendent of the Year. Co-sponsored by Aramark, VALIC and AASA, the 2017 National Superintendent of the Year was announced at AASA’s National Conference on Education, March 2-4, 2017, in New Orleans, La. Utterback was named the 2017 Oregon Superintendent of the Year in October by the Oregon Association of School Executives (OASE) and the Confederation of Oregon School Administrators (COSA). Utterback has over 27 distinguished years in public education, the past four years as superintendent of the North Clackamas School District. A suburban school district serving over 17,000 students on 32 school campuses, North Clackamas Schools are continuously recognized as innovative leaders in the state of Oregon. In 2013, Utterback oversaw the development of the district’s Strategic Direction and Plan. A community engagement process resulted in three clearly articulated goals and action plans in the areas of student achievement, equity, and quality programs. With a clear plan and process for communication, the district’s vision is felt and supported in every corner of the district. “Matt Utterback is an outstanding superintendent. His daily leadership for equity is seen in his thoughtful manner and unquestionable commitment to serving every student under his care. He is revered by his staff and is highly focused on improving system outcomes to secure individual student success. Matt is a humble person who leads others with urgency and grace. I am inspired by his skill, passion and success. He is clearly one of the best,” Rob Larson, Director of the Oregon Leadership Network. With laser-like focus on results coupled with a lens of equity, North Clackamas has not only begun to close opportunity gaps, but those gaps have narrowed to nearly non-existent in some areas. The overall four-year graduation rate increased from 66% to 83% in four years. In addition, graduation rate gains made since 2011 with students with disabilities (+24 percent), African American/Black students (+52 percent), and Hispanic/Latino students (+23 percent) are most encouraging. Of note is the 89 percent graduation rate in 2015 for the District’s African American/Black students. North Clackamas Schools currently maintain the highest graduation rate and the highest attendance rate among the largest districts in Oregon. Under Utterback’s leadership, resource allocations of the district’s $182 million general fund budget have been strategically directed to improve student achievement and close opportunity gaps. The district continues to lower class sizes, has implemented full-day kindergarten and a has five-year plan to renew curriculum through a lens of equity and a focus on technology integration. In addition, the district is poised to pass a $433 million capital construction bond in November 2016 after two years of planning and community outreach in which Utterback led nearly 200 public engagement and listening sessions. The district has become a focus for innovative and creative investing. In the past year, the district’s flagship career and technical program has received over $750,000 in additional funding to expand and enhance its 16 CTE program offerings. North Clackamas also received a renewable $1.4 million grant from the Oregon Department of Education to work collaboratively with teachers in the areas of professional learning opportunities, career growth, and meaningful evaluation systems. Utterback has been married to his wife Nancy, a high school English teacher in North Clackamas Schools, for over 28 years. They have one daughter, Emma, who is also a graduate of the school district. In his free time, he enjoys spending time with his family, attending sporting events, and running. Utterback will be honored at the 2016 Oregon School Boards Association Convention November 12; at the 2017 OASE Winter Conference in Lincoln City in January; at the 2017 AASA National Conference in New Orleans, LA, in March; and at the 2017 COSA Annual Conference in Seaside in June.